Check out Adam’s Tongue: how humans made language, how language made humans by Derek Bickerton. By studying the differences between animal communication and human language, he offers new perspectives on our development as a species. He seems to claim humanity, not just human society, evolved in large part due to the creation and application of speech. Perhaps that is too complex a beginning. 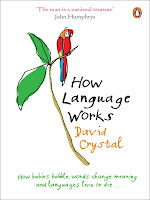 For the development of language itself try A Little Book of Language by David Crystal. Its short chapters build on the previous, making this a fast-paced examination. This is good, since the list of topics are surprisingly long. Among these topics are baby talk as a learning tool, how to hold a simple conversation, how word use defines meaning, and how languages begin, develop,and die out. In a similar vein, try How Language Works: how babies babble, words change meaning, and languages live or die by David Crystal. Its scope is effectively the same, as is the clarity, brevity, and levity. The difference, as with all language, is the presentation. I appreciate the clever chapter headings; each begins with the question of how. Examples include ‘How speech can go wrong’ - a chapter on the physical, psychological, and neurological problems that could hinder speech, and ‘How reading and writing can go wrong’ - a chapter on learning disabilities...not about my blogging. Interested in how language and culture interact? Take a peek at The Stuff of Thought: language as a window into human nature by Steve Pinker. As a linguist and cognitive scientist, his ‘trilogy’ ends with this title. The first, The Language Instinct, covers language development. One could also try Through the Language Glass: why the world looks different through other languages by Guy Deutscher; which seems to focus on linguistic and cultural divides. Both of the above titles are thick reads, heavy on the analysis. 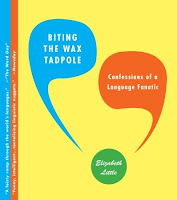 For a sillier book, try Biting the Wax Tadpole: confessions of a language fanatic by Elizabeth Little. The title is based on an actual, phonetic translation of ‘Coca-Cola’ into Chinese: ‘ke-kou ke-la’. That translated reads ‘bite the wax tadpole’. This book is full of similar anecdotes and trivia, composed by a language enthusiast. Icelanders must have all unique baby names approved by the Naming Council. Jabba the Hutt of Star Wars fame spoke a language based loosely on South American Quechua. And a man formally known as Theodor Geisel entered a bet wherein he had to write a children’s book using no more than 50 different words...and only one adjective: Green. Can you name the book? He traces the invention, progress, acculturation and adaptation of what we call ‘English’. After examining Old and Middle English, he moves from Chaucer to Shakespeare, to Samuel Johnson and the growth of lexicography, then to regionalism, North American English, Ebonics, military speak, and more variants. 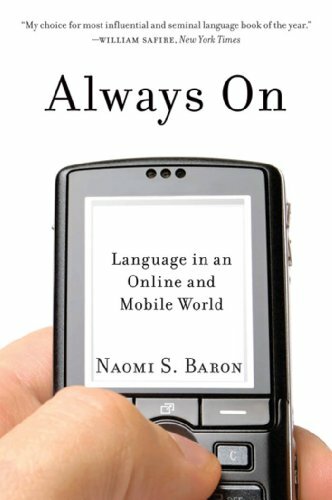 Where many languages have evolved over many centuries, this book is focused on the 500 plus languages that were artificially created. Whether the creator thought their native language was outmoded, outdated, inaccurate, or simply lacking elegance, each attempted to create a new, universal dialect. This includes Star Trek’s Klingon and Lord of the Rings’ Elvish language Tengwar. She argues that our language(s) are on the cusp of a fundamental change, thanks to our new technologies. But she claims it isn’t the texting, emailing, or blogging alone that is undermining our communication. It is the art of communication and the structure of conversation that is adapting to social media and the new online ethic. They all look so good. Terrific post - thanks Eric!